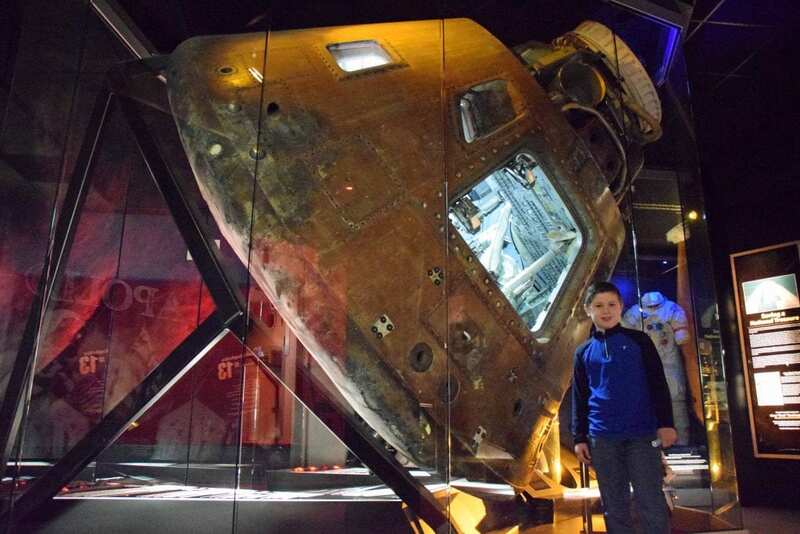 As Colt’s interest in space has grown, he’s been keeping up with which artifacts he’s seen in person — specifically capsules from notable missions. Apollo, for example — he’s seen Apollo 7, 11 and 14. And he’s been Googling around to make his list of which museums in which cities we need to visit in order to see them all. Which brings us to Hutchinson, Kansas. A few months ago Colt discovered that Apollo 13 (Yes! THAT Apollo 13!) is kept as part of an incredible collection in a museum called the Cosmosphere. In Hutchinson, Kansas. 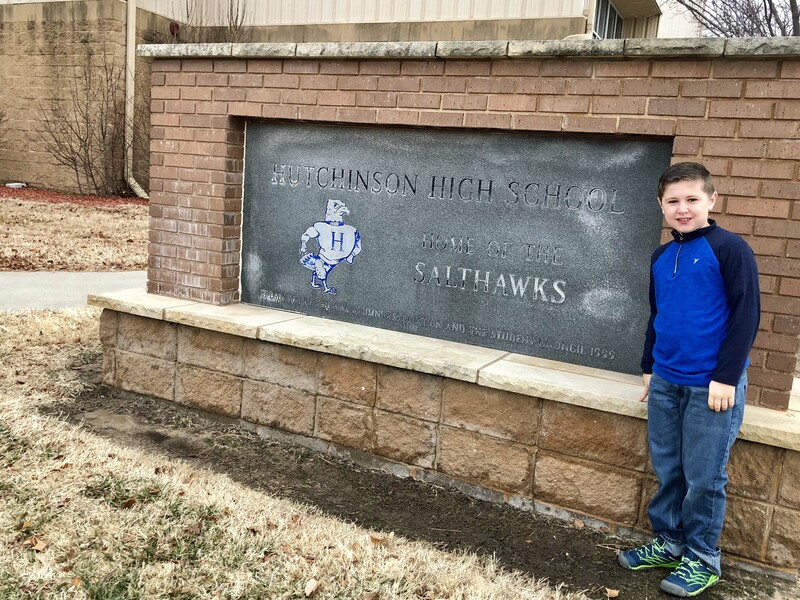 I’d never even HEARD of Hutchinson, Kansas. 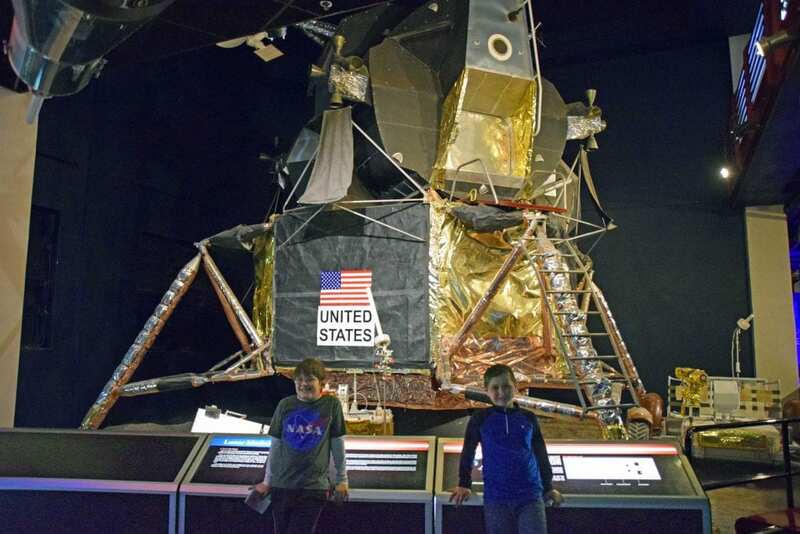 And after doing a little homework, we learned that not only do they have the Apollo 13, but the Cosmosphere is a Smithsonian affiliate and they have the largest combined collection of US and Russian space artifacts IN THE WORLD. 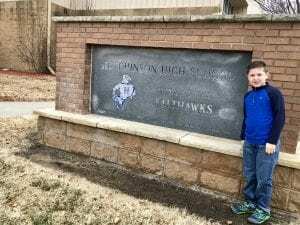 So we made plans to pick a weekend and do a quick trip to Hutchinson. And we invited our buddies Aaron and Nancy to come with us. 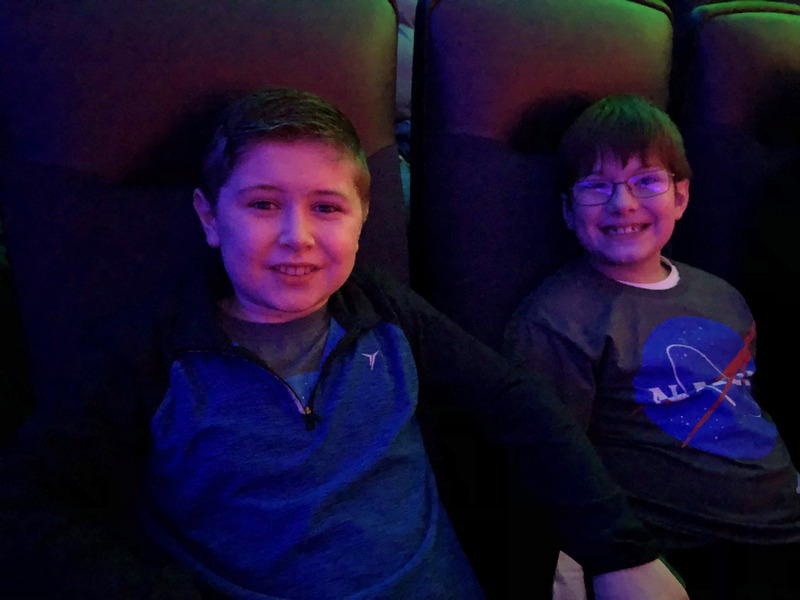 Nancy and I have been friends for years and recently discovered our boys share an interest in space — we’ve been talking about getting them together for some space adventure and this was the perfect opportunity. When it comes to maximizing our time at science museums, we are pros. And that means being doorbusters. The four of us were in the Cosmosphere parking lot at 8:55am ready for the doors to open. 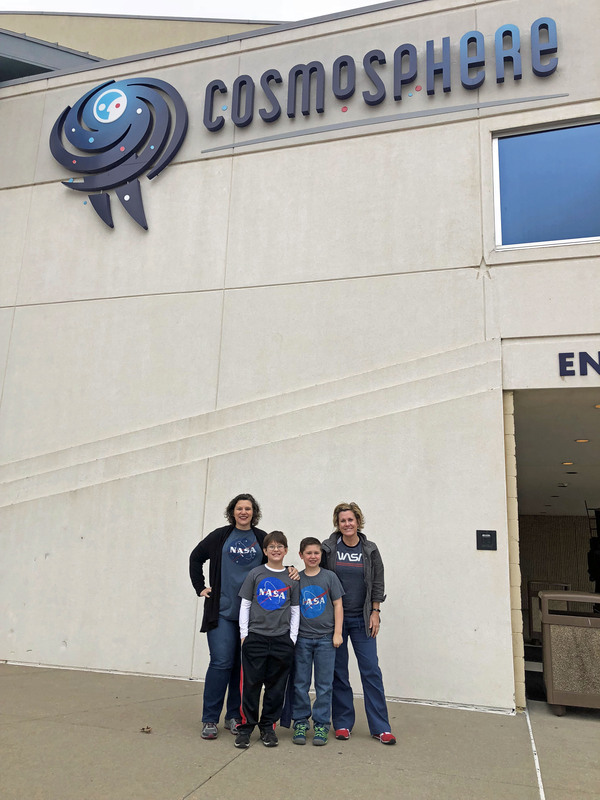 Wearing matching NASA shirts. 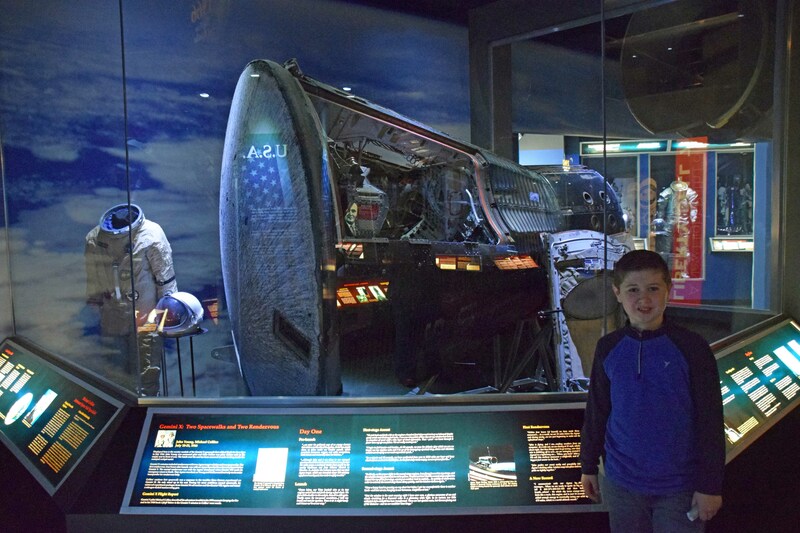 The museum itself is laid out chronologically beginning with German advancements in rocketry during World War II and winding its way through the Cold War, to the American Mercury and Gemini programs, and finally to the Apollo program and an entire gallery devoted to what they call “The Astronaut Experience” — complete with a variety of space foods, clothes, sleeping bags — and the ever-popular-with-middle-school-boys space toilet. Space Photography! My favorite exhibit! A tribute to those lost in the pursuit of space. 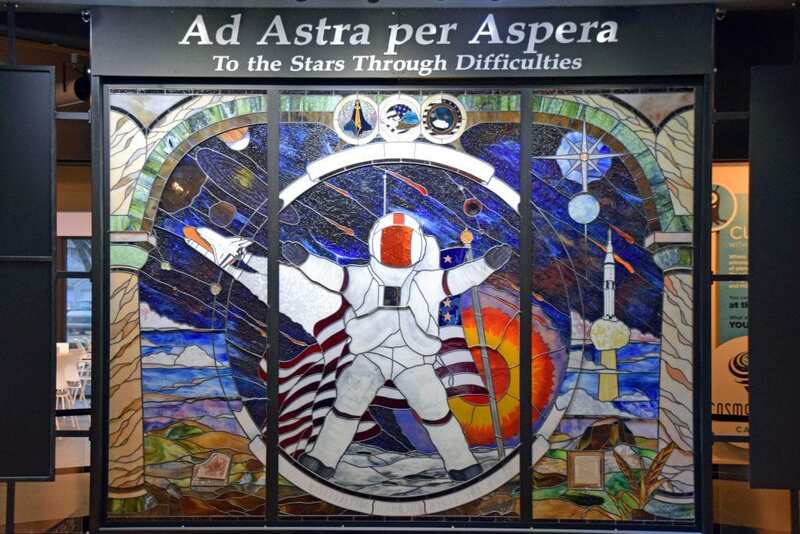 Pieces of the Challenger, Columbia, and Apollo 1 were embedded in this beautiful window. It was amazing. And the boys were riveted. I cry every single time I watch that final scene of the movie when the mom is squeezing her kids and the whole world is holding its breath and waiting to know if the astronauts survived reentry and the radio is silent for far too long and just when you think they’re about to get horrible news YAY! TOM HANKS! I’ve seen it probably a dozen times and I just can’t help it — I cry because it’s just the most wonderful story about the most wonderful triumph. And here we were, standing in front of the capsule those men used to change history. And the suit Jim Lovell wore when they did it. 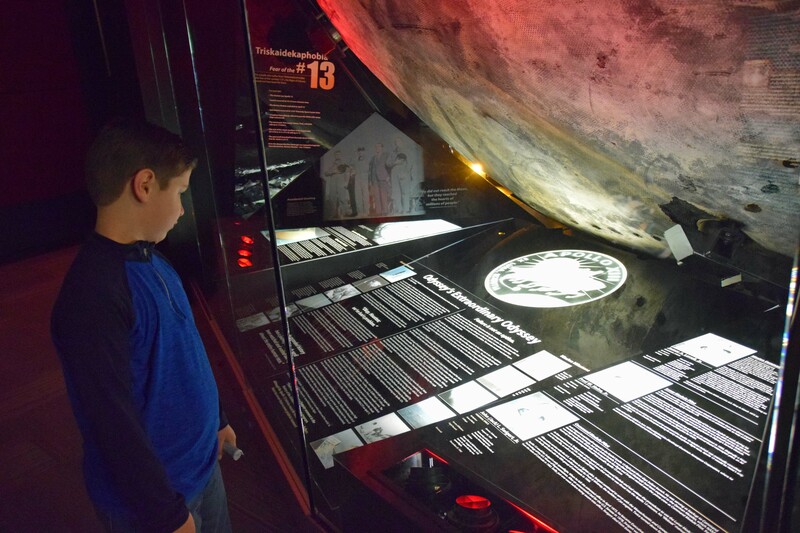 The story of the Cosmosphere’s relationship with Apollo 13 is captured there, too. The capsule was essentially scattered across the world for testing and a variety of other reasons, and the Cosmosphere committed itself to gathering it all — piece by piece — and restoring it for display and for generations to visit and admire. They did the restoration in a glass room so visitors could see it all, even before completion. And just weeks after it was all done, the man responsible for championing the project, died unexpectedly of a heart attack. He would never see his passion project unveiled in the Cosmosphere gallery. It was all just beautiful. We took our time in the gallery then headed to watch a few shows in other sections of the museum. 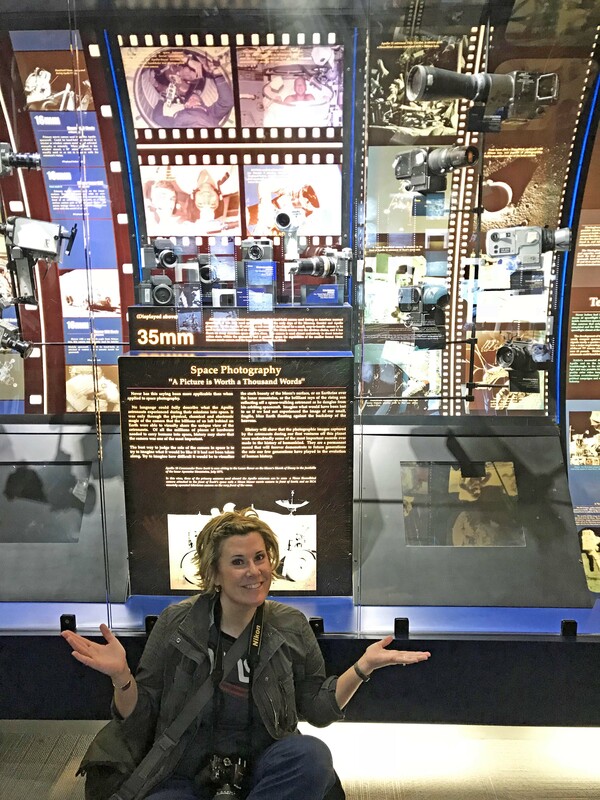 A two-story dome-shaped theater featured “Space NEXT” that dazzled us with the latest technologies engineers are using to get us to Mars. Then! We staked out the front row of a show they called Dr. Goddard’s Lab — and WHOA. 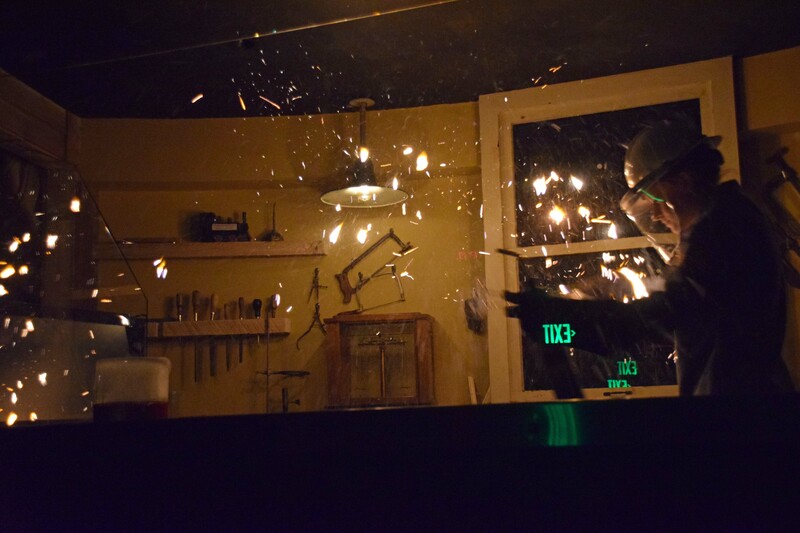 It was a live show of live experiments (and explosions!) that taught us the basics of rocketry. It was incredible. Our guide, Hannah, used humor and simple terms to explain the basics and blow things up right in front of us. Oxygen + Fuel + Heat Source. This was the split second JUST AFTER the split second Hannah ignited a giant ball of cotton she’d just soaked in liquid oxygen. It EXPLODED. We finished our day with an incredible planetarium show — which was special not only because it was a terrific tour through all four seasons of the night sky, but also because the planetarium is where the Cosmosphere all began. 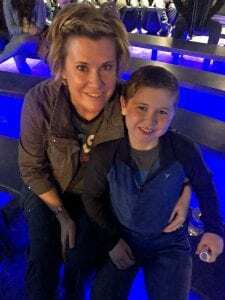 A lifelong space and science enthusiast named Patty Carey started a small but mighty planetarium on the Kansas State Fairgrounds in 1962. 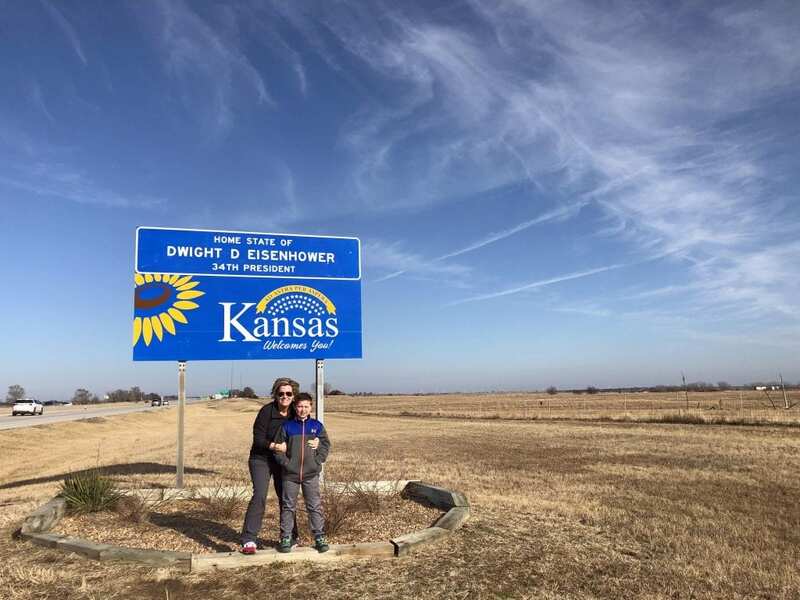 Over the years, it grew in popularity and funding and as it collected artifacts and established a reputation and partnership with the Smithsonian, it became an incredible gem right in the middle of Kansas. We just couldn’t believe such a place is only hours from us and not surrounded by a large city. I’m so glad we gave the Cosmosphere a try. Waiting for the Planetarium show to begin. Get the Hutchinson discount. Strataca and Cosmosphere have a partnership that gives a $5 discount if you visit both within 10 days and present the ticket from your first destination. And! 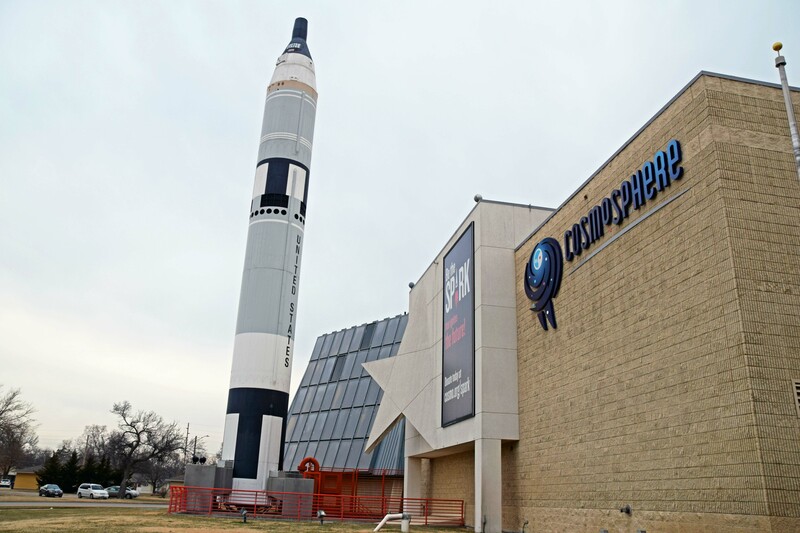 Cosmosphere is a member of the ASTC passport program — a membership to another passport museum like Northwest Arkansas’s Amazeum gets you in the door for free! Plan to spend a day. We knew our boys would want to take their time so we arrived when the doors opened and planned to spend the entire day — leaving only when the boys had their fill. Don’t rush it – there’s so much to see. So very interesting. I would love it! !